GiftsKorea's Giftspop is the quickest and easiest way to send a gift to someone in South Korea. No need to run out and find a gift - with GiftsKorea's Giftspop you can send a thoughtful gift from leading retailers with only a few clicks right in the invitation. You don’t even need a shipping address! Just need the recipient's name with mobile no. in South Korea for sending the mobile gift voucher to the recipient's mobile by SMS or MMS. Your recipients can redeem your gift at any nearest retailers locations. 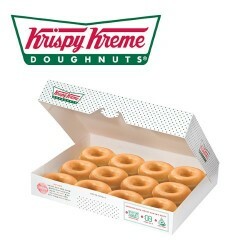 Order Online Donuts, Coffee, Pizza, Hamburger, Chicken, Ice cream, Start here. Giftspop There are 33 products. An economical set for ice cream enthusiasts, All 4 of which are pints! Your recipients can redeem this gift at any nearest Baskin Robbins locations. A cake filled with sweetness of cotton candy! - Ice cream flavor: strange country's cotton candy, cherry jubilee, cookie and cream, mother alien, berryberry strawberry, New York cheese cake, Shooting Star Your recipients can redeem this gift at any nearest Baskin Robbins locations. Half gallon size with 6 flavors of ice cream! Your recipients can redeem this gift at any nearest Baskin Robbins locations. A pack of 10 donuts + 2 Americano (S) Your recipients can redeem this gift at any nearest Dunkin Donuts locations. Potato Original (L) + Cheese Bolognese Spaghetti + Coke 1.25LYour recipients can redeem this gift at any nearest Domino's locations. Black Tiger Shrimp(L) + Cheese Bolognese Spaghetti + Coke 1.25L Your recipients can redeem this gift at any nearest Domino's locations. Wagyu & Bistecca(Original)(L) + Half &Half Spaghetti + Coke 1.25LYour recipients can redeem this gift at any nearest Domino's locations. Black Angus Steak Pizza(Original) + Cheese Bolognese Spaghetti + Coke 1.25LYour recipients can redeem this gift at any nearest Domino's locations. Mozzarella in the Burger Bacon Set Your recipients can redeem this gift at any nearest Lotteria locations. Original DozenYour recipients can redeem this gift at any nearest Krispy Kreme Doughnuts locations.